In typical Arthur Hills fashion, Persimmon Ridge’s first hole is gentle warmup for the test that lay ahead. 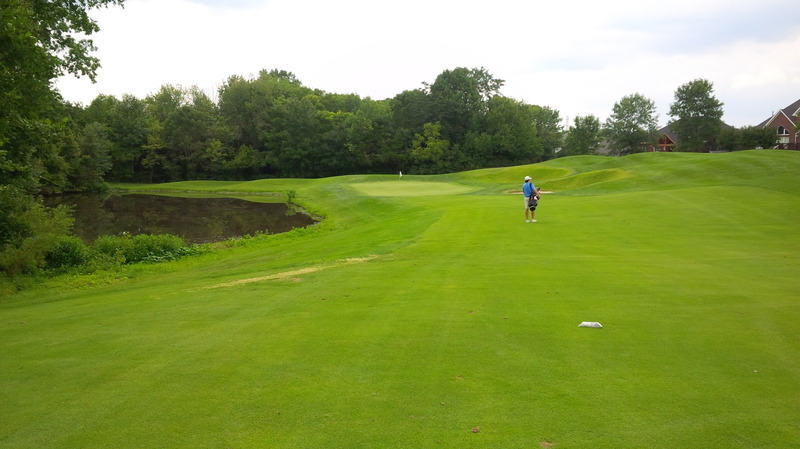 I generally enjoy Arthur Hills courses. They are big, wild, sometimes cruel golf courses that test golfer’s shot making at every turn with gigantic greens at which to aim. Persimmon Ridge Golf Club in the outskirts east of Louisville may be one of the crown jewels of Hills’ design portfolio. I recently had the opportunity to join a handful of other regulars from Golf Kentucky Links to play a skins game, put faces to names, and share some stories at Persimmon Ridge. 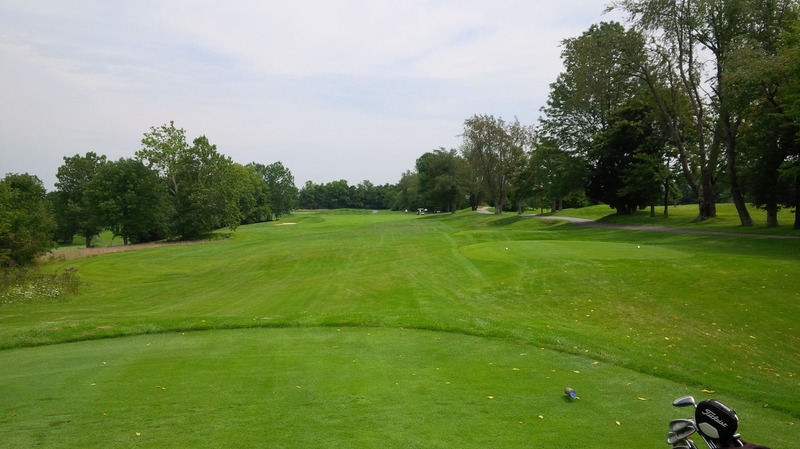 So on a nearly perfect, almost cool summer afternoon, I took the opportunity to walk the course’s magnificent 18 holes, an experience that I’d highly recommend, but only if you’re in decent cardiovascular health (my pedometer app measured my stroll at 7.65 miles from 1st tee to 18th green, with no flat spots in between). The split fairway on the par 5 3rd hole was the first of many instances in which a little experience or local knowledge of the course would have paid huge dividends. Prior to this outing, I had wanted to play Persimmon Ridge out of curiosity and out of respect for its imposing reputation. 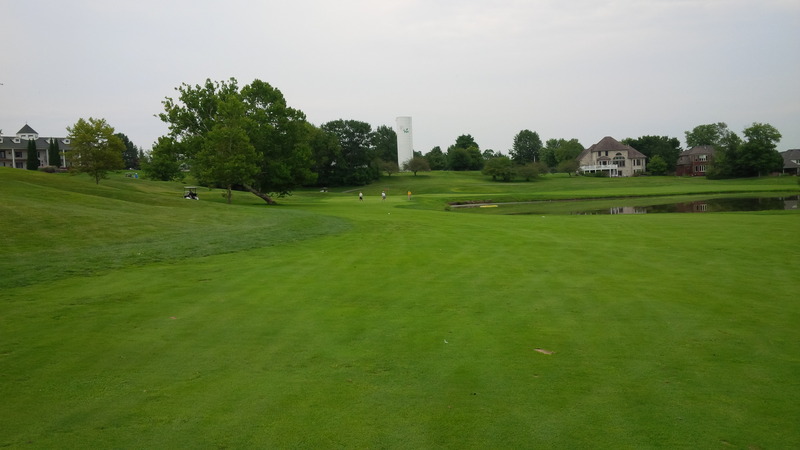 Since I started paying attention to golf in the 1990’s, Persimmon Ridge had held a special place in the “lore” of Kentucky golf as one of the “Big 3” of the state’s most difficult, championship golf courses. Opened in 1989, Persimmon Ridge has a winding and interesting ownership and operational history, which I can’t do justice here, but would encourage you to check out on the club’s website. When the PGA Championship came to Louisville and Valhalla in 1996, people who much more about golf than I did held Persimmon Ridge and Triple Crown Country Club in the same regard as Valhalla Golf Club, with many asserting that Persimmon Ridge was actually harder than Valhalla. 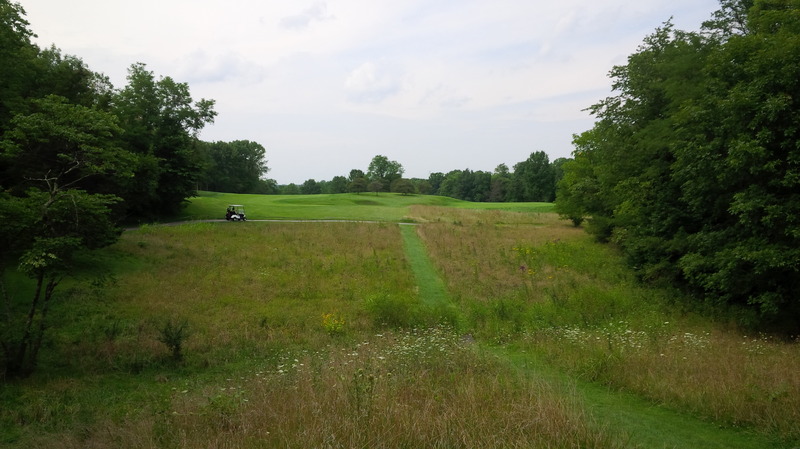 That memory of the way Persimmon Ridge had been regarded stuck with me in the interim two decades, so when I finally got the opportunity to play the course, I was frothing with excitement and anticipation. Naivety is doubled edged from Persimmon Ridge’s 4th tee; you really can’t see all of this short par 3’s dangers, so you don’t know what to be afraid of, I suppose. My walking partner, Jason, and I played our rounds from the blue tees, from which Persimmon Ridge plays to a hulking 6,664 yards with a course rating of 73.3 and slope of 144. After three putting the first green from 18 feet and just missing a par putt from about 12 feet at the second green, I was resigned to mentally strap in for a roller coaster of a round of golf. I quickly recognized many customary Arthur Hills design features, including the extensive mounding and moguls, lots of bunkers, and enormous greens. The tee shots included a nice mix of straight-forward driving holes, holes that were visually more intimidating than the shot demanded, and illusions whose serenity beguiled that danger awaiting on or adjacent to the fairway ahead. Hills use of the host property at his diabolical best: a deep green sloping away from bunkers on the right towards the lake on the left. Considering how inconsistently I’d been driving the ball before, during, and after my round at Persimmon Ridge, mental discomfort on the tee box was the least of my problems. Much like Longaberger, another Hills masterpiece, each hole at Persimmon Ridge had multiple trouble spots which were required to be avoided. So despite being a long course, being short off the tee wasn’t necessarily fatal at Persimmon Ridge, as long as one stays out of the hazards and other troubles. The real challenge at Persimmon Ridge doesn’t really begin until the golf ball gets close to the green. These enormous greens were firm, fast, sloped, and undulating, and usually guarded by a bunker, a water hazard, severe moguls, or a combination of all three. 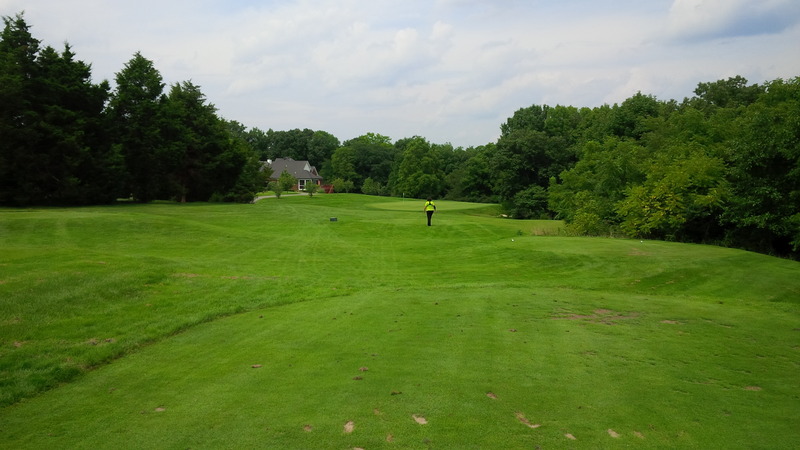 Other than the tee boxes, which were in fantastic shape, there were very few flat spots to be found at Persimmon Ridge. The contoured details of Persimmon Ridge’s greens are obviously man-made, yet the greens aren’t out of character with the course’s amazingly scenic setting. In fact, I’m sure untold tons of earth were repositioned to create Persimmon Ridge, to accent the hills and moguls, and create the elevated tee boxes and greens. However, it all fits wonderfully with the naturally hilly terrain and heavily wooded character of the course’s surroundings. As a walker, there were several instances where the walk from the green to the next tee was challenging, to say the least. 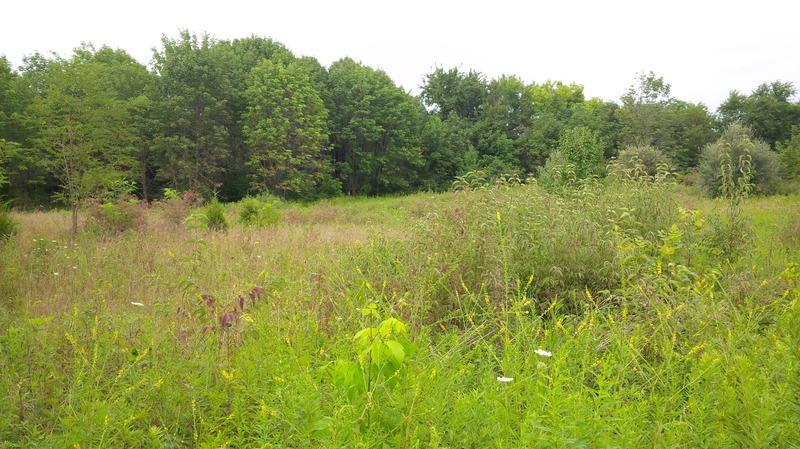 The long stroll from the 9th green to the 10th tee through this meadow was a nice interlude between the two nines. However, the incredibly raw, natural beauty of the woods and fields found along these walks made it less a chore and more of a joy, a reprieve from the demands of a stern test of golf. And Persimmon Ridge definitely was a stern test of golf. As has been the case more often than not this year, my ability to get off the tee effectively came and went and then came back within the span of 18 holes. My only real strong criticism of Persimmon Ridge is that there isn’t a great deal of variety between many of the 12 par 4 holes. Sure, most of the holes bent slightly one direction or the other, with hazards shaping the best route to par. One of the distinctly unique holes at Persimmon Ridge, the 7th green lays in a the bowl left from one of the original farm ponds on the property. However, all seven par 4 holes on the front nine measured between 370 and 400 yards, which basically meant pull driver on every hole. Except for differences in if one wanted to challenge a flag or play it safe to the middle of the green, there weren’t many true risk/reward opportunities other than on the three par 5 holes at Persimmon Ridge. A quick peek up and down the scorecard revealed that the same was true of the other tee boxes, with each set of tees keeping the golfer within a narrow yardage range. I’m not sure if the design was hemmed in by the surrounding real estate development or other factors, but I think it could be a richer golf experience if there was more variety available off the tee. The par 5 18 hole is a spectacular finishing hole, with water guarding the fairway and green to the right, with a natural spectator amphitheater just to the left of the green. On the other hand, after playing the course, it’s obvious that the real superstars of Persimmon Ridge are the greens. 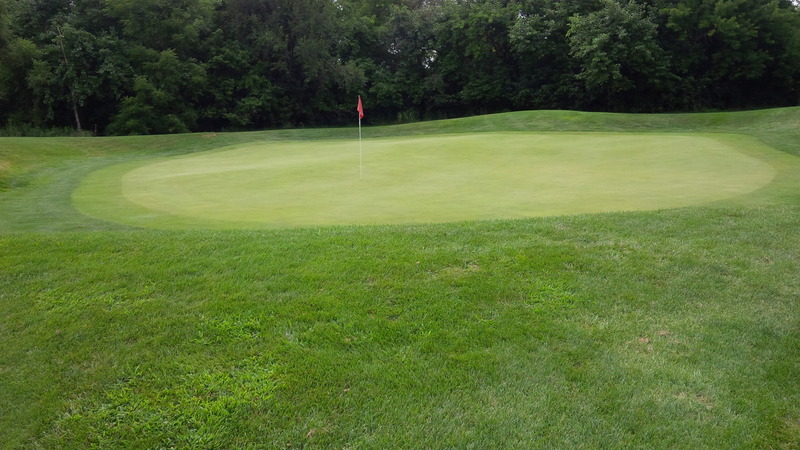 The greens are so large, and the slopes and undulations are so severe, that when combined with the firm, fast conditions, simply being on a green in regulation was no guarantee of bogey, much less par. 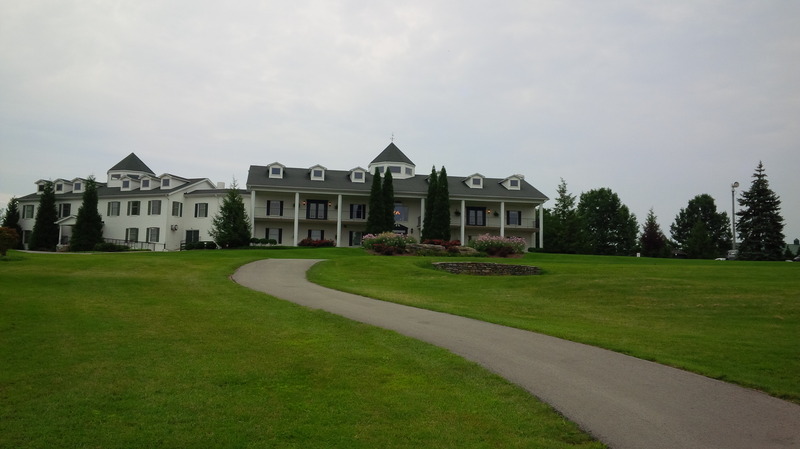 Persimmon Ridge is a fantastic golf course on a spectacular property. I remember thinking as I drove away from the course, with three net skins in my pocket, that the course doesn’t suffer weak games or weak-minded golfers. Persimmon Ridge maintains a private club membership, but occasionally the course will open up tee times to public play, especially during the latter part of the summer. The massive Persimmon Ridge clubhouse awaits atop the hill leading away from the 18th green. 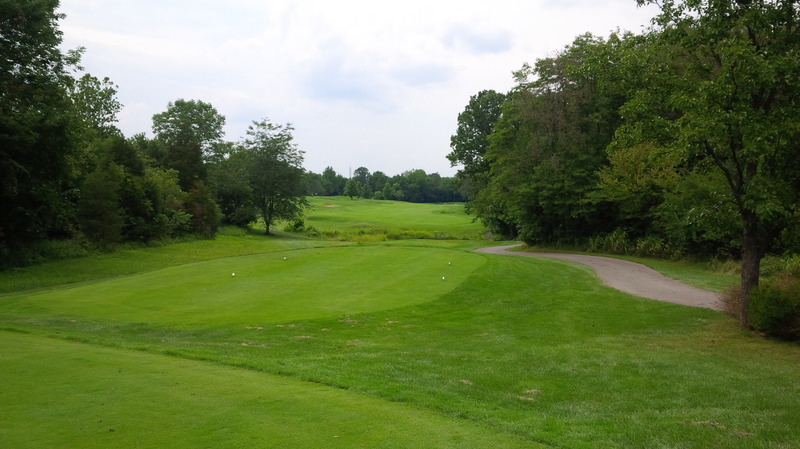 So if you find yourself around Louisville, and want to play a really challenging round of golf on an immaculately conditioned tract, see if you can’t find your way on to Persimmon Ridge. You’ll be glad you did.